Godlan, a manufacturing ERP software specialist (SyteLine ERP), EAM (Asset Management) specialist and Infor Gold Channel Partner announced today the launch of their new website hosted at http://godlaneam.com. The site is dedicated to EAM (Asset Management Software), process improvement, cost reduction / profit increasing best practices, and also hosts scores of free whitepapers, informative videos, and other useful information for today's forward moving enterprise. 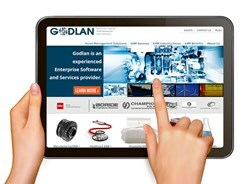 Godlan, a manufacturing ERP software specialist (SyteLine ERP), EAM (Asset Management) specialist and Infor Gold Channel Partner announced today the launch of their new website hosted at http://www.godlaneam.com. The site is dedicated to EAM (Asset Management Software), process improvement, cost reduction / profit increasing best practices, and also hosts scores of free whitepapers, informative videos, and other useful information for today's forward moving enterprise. The new website features the latest in functionality, design, and navigation - with a focus on delivering tools and content of value to enterprise businesses. The all new godlaneam.com hosts hundreds of pictures, screenshots, how-to demonstration videos, industry White Papers, Executive Brief research papers, and ways to research. It features fully integrated social media for easy sharing, as well as event feeds for webinars and live events that prospects and customers can register for. Getting help or asking a question is easy by phone, email or through live chat. With busy "on-the-go" executives in mind, the site is designed to present condensed topics followed by more expanded information, to make navigation easy. It is also accessible through a wide range of web browsers and devices, including mobile and tablets, and has been designed to meet all relevant accessibility standards. The website makes it easy to search topics based on industry verticals such as Manufacturing, Healthcare, Hospitality, Public Sector, Oil & Gas; or by solutions for specific functional areas such as EAM Enterprise, EAM Energy Performance Management, and Infor MP2. With over 20 years of asset management experience built in, EAM Enterprise has been helping companies around the world—including more than 60% of the Fortune 500. Godlan achieved a TEC Accreditation for ERP Solutions 2013, was awarded the Infor North America SyteLine ERP Partner of the Year in 2011, Infor Regional Partner of the Year 2013 and is an approved Infor Gold Channel Partner serving customers for over 29 years. For more information, visit godlan.com or call 586-464-4400. Godlan is a leading manufacturing performance specialist that has been implementing integrated technology solutions since 1984. As an approved Infor Gold Channel Partner with a focus on Infor SyteLine ERP, Godlan supports the implementation of world-class processes and best practices throughout discrete manufacturing organizations. For more information about Godlan, its mobile application InSync Anywhere, or Infor SyteLine ERP manufacturing software demos, call 586-464-4400, visit godlan.com or follow us on Twitter @Godlan_Inc. Infor is fundamentally changing the way information is published and consumed in the enterprise, helping 70,000 customers in more than 200 countries and territories improve operations, drive growth, and quickly adapt to changes in business demands. Infor offers deep industry-specific applications and suites, engineered for speed, and with an innovative user experience design that is simple, transparent, and elegant. Infor provides flexible deployment options that give customers a choice to run their businesses in the cloud, on-premises, or both. Infor EAM Enterprise v11 PDF Overview Brochure DownloadTurn asset management into a competitive advantage with Infor EAM Enterprise v11. Infor EAM Enterprise PDF Overview Brochure DownloadContinuously improve your business - Infor EAM Enterprise Asset Management Software Infor PLM Discrete 10XStreamline even your most complicated processes for developing, launching, and managing products. White Paper The Mobile (R)evolution Choosing the right road to mobile enablementMobility is a technology that has quickly become an intimate part of daily life, with adoption and popularity going nowhere but up. Though mobile’s roots may have started in the consumer world, its uses have been spilling over into the business environmen Configurator provides a holistic approach to the design, sales, and production of customized products.Infor SyteLine Configurator ensures configured orders are feasible for the production department by providing clear visibility across inventory and schedules. Infor ION Connect >Infor™ ION Connect applies a fresh approach to making multiple disparate software systems work as a unified whole, while also accelerating your end-to-end business processes and reducing risk. Download the Infor 10x brochure >Infor 10x brochure download - Think flexible and collaborative. Think beautiful, scalable, integrated, and mobile.